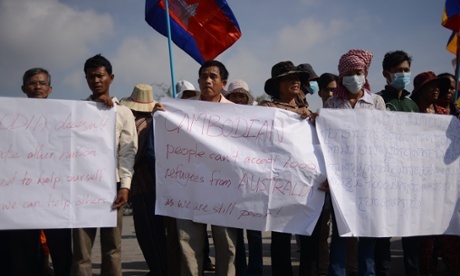 Protesters outside the Australian embassy said Cambodia is not fit to accommodate refugees, as it cannot take care of its own people. Monks, students and villagers from two of Phnom Penh’s most notorious eviction sites protested outside the Australian embassy on Friday, calling for a controversial refugee settlement deal not to be signed later in the day by the immigration minister, Scott Morrison. Details are scant on what the memorandum of understanding contains, but it would see refugees who intended to seek asylum in Australia – only to be sent to the South Pacific island of Nauru – resettled in Cambodia. Morrison is expected to ink the deal in a joint ceremony with Cambodia’s interior minister, Sar Kheng, at 3pm on Friday. The embassy road was heavily manned with riot police, who erected barricades at either end to prevent the rally from getting too close. Protesters held up signs calling for Cambodia’s own dismal human rights and poverty situation to be addressed first. Another said Cambodia can’t accept what Australia has proposed, “as we are still poor”. On Friday morning Morrison revealed that Australia will give $ 40m in aid to Cambodia, but denied it was part of a deal to take the refugees for resettlement. The group of about 50 protesters made their way on foot around the block to get as close to the building as possible in order to hand in a petition asking for the deal to be called off. At one point, in the shadow of the imposing embassy wall, a woman called Bo Chhorvy, from the Boeng Kak community – where 3,000 families have been evicted and their houses torn down to make way for a massive development project – was knocked down by police officials and suffered a cut to her head. Her friends dragged her aside and tried to revive her. 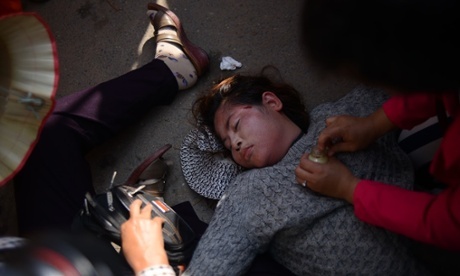 Bo Chhorvy, a land activist from the Boeng Kak community, was knocked unconscious in a scuffle with police at one of the barricades. “We cannot accept refugees,” a monk yelled into a loudspeaker. Cambodia is the 17th most corrupt country in the world, according to the Transparency International corruption index. Chhay said he was concerned that the $ 40m could be siphoned off, and that Australia should shoulder the responsibility of doing business with Cambodia.